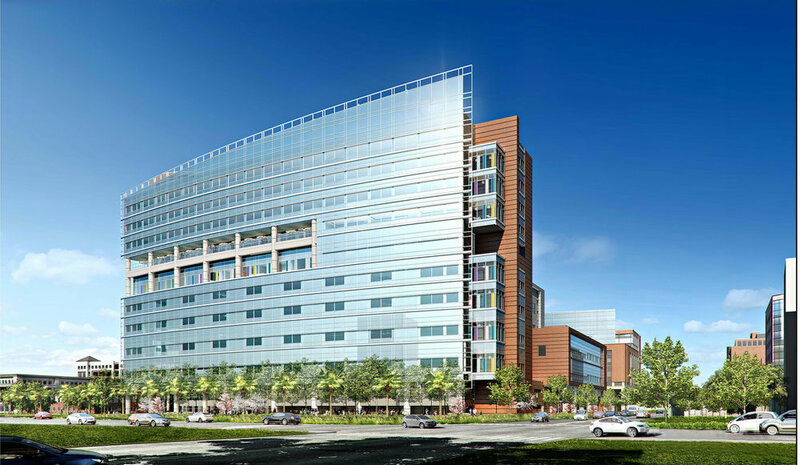 The new $385 million Shawn Jenkins Children’s Hospital and Pearl Tourville Women’s Pavilion will be a replacement hospital for children’s services and women’s labor and delivery services. The ground up facility will stand over 200 feet high in the medical district on the peninsula and consist of an 11-story patient tower and a 6-story diagnostic and treatment building. A patient transport helipad will be atop the patient tower. Children’s services will include emergency services, clinical and imaging specialties, Cardiac Intensive care unit, general surgery Intensive care unit, specialty burn care rooms, an 82-bed neonatal intensive care unit, bone marrow transplant and cancer unit, and general, specialty, and open-heart operating rooms. Women’s services will include post-partum and anti-partum care units, labor and delivery room suites, and c-section operating rooms. The new facility will also include a dining hall and outdoor terrace on the 7th floor overlooking the Ashley river as well as a child-life roof top garden and play area. The hospital has a 3.5-year construction schedule and will open in October of 2019. We hope you'll join us for the tour and happy hour to follow.